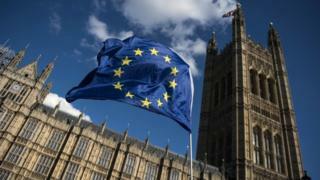 Brexit amendments: What might MPs vote on? MPs will vote later on whether or not the UK should seek permission from the EU to delay Brexit beyond 29 March. Backbench MPs and opposition parties put forward eleven amendments to show what they want to do next. Speaker John Bercow has selected four amendments for debate, although not all will necessarily be put to a vote at 1700 GMT. But his decision to allow one calling for another referendum - but not one ruling another referendum out - has been questioned by some Brexiteers. Tory Brexiteer Mark Francois said it was signed by "127 members of this House including the entirety of the DUP, 13 members of the Labour Party, and one independent to boot" as well as more than 100 Conservative MPs - and asked Mr Bercow why it had not been selected. Mr Bercow told him "members do have to take the rough with the smooth" and he tried to "always do my best to be fair to the miscellany of different points of view represented in this House". (3) notes that, if the House has not passed a resolution approving the negotiated withdrawal agreement and the framework for the future relationship for the purposes of section 13(1)(b) of the European Union (Withdrawal) Act 2018 by 20 March 2019, then it is highly likely that the European Council at its meeting the following day would require a clear purpose for any extension, not least to determine its length, and that any extension beyond 30 June 2019 would require the United Kingdom to hold European Parliament elections in May 2019. The cross-party amendment (h) from independent MP Sarah Wollaston, the SNP's Philippa Whitford and Joanna Cherry, Lib Dem Tom Brake and Labour's Neil Coyle calls for another referendum and would be the first to be voted on. It changes the wording of the government motion to instruct the prime minister to request an extension to the Article 50 process "sufficient for the purposes of legislating for and conducting a public vote in which the people of the United Kingdom may give their consent for either leaving the European Union on terms to be determined by Parliament or retaining the United Kingdom's membership of the European Union." If it is supported, the following two amendments - from Hilary Benn and the Labour frontbench - would not then go to the vote and MPs would be asked to vote on Chris Bryant's amendment next. If it is rejected, MPs would vote on the next one on this list. Labour will not be backing this amendment, saying it is not the right time to push for another public vote, reducing its chances of success. This cross-party amendment (i) would allow MPs to take control of the process in Parliament on Wednesday 20 March, to force a series of indicative votes to establish MPs' preferred option for Brexit. It is backed by senior backbenchers: Labour's Hilary Benn and Yvette Cooper, the Conservatives' Sir Oliver Letwin and Dominic Grieve, Lib Dem Norman Lamb and the SNP's Stewart Hosie. It calls for an extension to the Article 50 process - delaying Brexit beyond 29 March - in order to "enable the House of Commons to find a way forward that can command majority support". In the Commons, Mr Benn said he would support an amendment to his amendment, from the Labour MP Lucy Powell, which adds that any extension to the Brexit process should end by 30 June. In a separate move, Cabinet Office Minister David Lidington has said that, if Theresa May's deal is rejected for a third time by MPs next week, the government will stage two weeks of debate following the European Council on 21 and 22 March, to allow the Commons to try to find a majority for a different plan. BBC chief political correspondent Vicki Young said it appeared the government was trying to spike the Benn amendment - which had a fairly good chance of getting through. If MPs reject it, they will be asked to vote on the Labour frontbench amendment next. If they back it, they will not vote on the Labour amendment and will go straight to a vote on the Chris Bryant amendment. Image caption Jeremy Corbyn's amendment would delay Brexit beyond 29 March to allow time for MPs to try to agree on a "different approach"
Amendment (e), is in the name of Labour Leader Jeremy Corbyn and Labour frontbenchers Sir Keir Starmer, Emily Thornberry, John McDonnell, Valerie Vaz and chief whip Nick Brown. It rejects the prime minister's deal, rejects no deal, seeks an extension of the Article 50 process to avoid a no-deal Brexit on 29 March and to allow the Commons to "provide parliamentary time" for the Commons to "find a majority for a different approach". Whether this is supported or rejected, MPs will then be asked to vote on the next amendment blocking a third "meaningful vote" on Mrs May's withdrawal deal. Image caption MPs held their second vote on Theresa May's withdrawal deal this week - a third is due next week. The fourth amendment (j) selected by the Speaker is another cross-party affair, backed by Labour's Chris Bryant, Stephen Doughty and Alison McGovern, Lib Dem Tom Brake, Plaid Cymru's Liz Saville Roberts and the SNP's Philippa Whitford. It orders the government not to put Theresa May's deal to MPs again for a third time. It notes that the parliamentary rulebook, Erskine May, "states that a motion or an amendment which is the same, in substance, as a question which has been decided in the affirmative or negative during the current session may not be brought forward again during that session". Brexit: What is the Norway model? What is a 'Canada-style' trade deal? Brexit: What is the Irish border backstop?